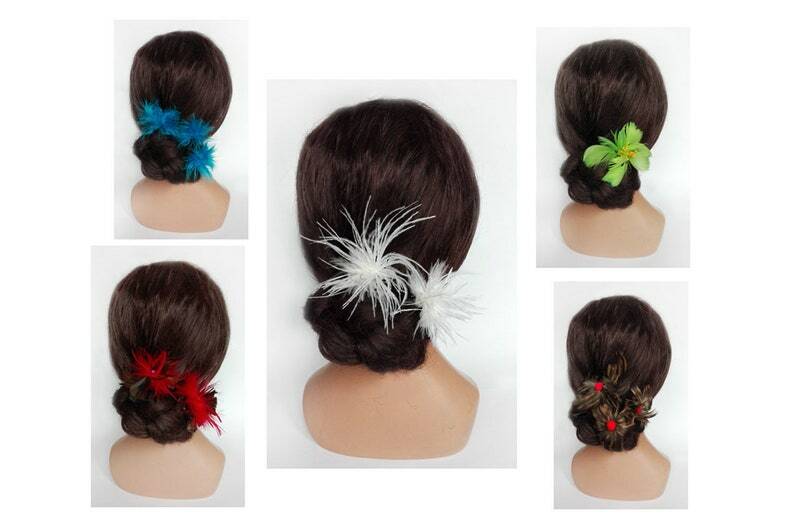 Floral inspiration for these five variations of feathers. The Red version: set of 2 made feather hair pins red and Brown iridescent, mounted on a small black natural straw holder. Feathers come in their hearts with small plastic beads. The diameter is about 6 cm. A touch of elegance and lightness for all occasions. The white version: suggestion for a bridal hairstyle with these two hair pins made of white ostrich feather. The diameter of the largest flower is 7 cm and 4 CMS for your baby. The green version: peak bun made of a flower-feather green with pistils yellow. The diameter is 7 cm. The Brown version: this version is made from brown feathers and small red PomPoms. These three flowers are between 5 and 6 cm in diameter. Shipping is done in tracking in a box envelope.